His House > Blog > Detox > What Is Involved in Drug Detox Programs? What Is Involved in Drug Detox Programs? Detox is the first important step in the treatment of substance abuse and although drug detox programs can last anything from 30 days to 3 months or more, detox has to be successfully completed in order to complete the journey. Many people with addiction issues are fearful of drug detox, largely because of the sometimes severe withdrawal symptoms that can manifest during treatment. However, one of the significant advantages of a professional detox program is that there are plenty of highly-qualified medical professionals on-hand to help manage the symptoms of withdrawal. Can Detox be Sufficient on its Own? Many people seeking addiction treatment are restricted in choices due to circumstances or affordability. For that reason, they may opt for a drug detox program on its own to get on the road to recovery at a lower cost and time commitment than a full rehabilitation program, which can run into thousands of dollars in costs. Aside from cost, another reason some people choose to attend just natural drug detox is down to family circumstances. Parents can find it particularly difficult to be away from their children for the weeks and months it can take to complete a full treatment program or time away from work or school can be an issue for others. Every individual has their own addiction journey, making the right kind of treatment a very personal decision. The length of time it takes to rid the body of substance or alcohol traces depends heavily on various factors. The main factor is the substance that has been used and for how long addiction has been present. A substance such as heroin, for example, takes around a week to detox from the body and others like LSD have no withdrawal symptoms at all, making natural drug detox possible in a shorter timeframe. Some heroin addicts choose to undergo rapid detox to cleanse the body of the drug. In rapid drug detox centers, a patient is anesthetized and treated medically to remove heroin from the system and can reduce detox time from a week to around three days. Rapid detox works by allowing the body to receive intensive treatment so that when a patient wakes up, they are no longer physically addicted to the substance. 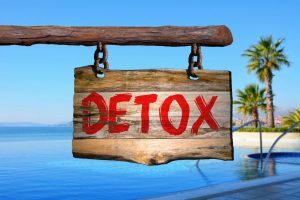 The advantage of a longer detox program is that there is more time to include counseling and therapy to assist with the transition from detox to normal daily life immediately afterward. The one thing that most people are aware of about the detox process is that the body has to go through physical withdrawal. Symptoms can vary wildly from patient to patient, depending on the substances abused and physical state of health. This is the main reason professional detox programs are recommended as symptoms can be managed in a controlled environment with full medical supervision. Some opiates like heroin and prescription drug Vicodin can be replaced with other drugs during detox like methadone, for a more comfortable detox experience. One downside of this kind of treatment is that addiction can be transferred to the replacement drug, although detoxing from a drug that’s been taken in supervised doses is considerably easier to detox than an opiate. At a drug detox center, patients receive 24-hour access to medical care and are regularly assessed and monitored to deal with withdrawal symptoms as they manifest. Many people report the detox process to be very intense and emotional, which can be complicated if an addict is used to self-medicating to handle difficult feelings. However, this emotional rollercoaster can be countered with individual and group therapy which is offered in specialist detox programs. What Are the Treatment Options after Detox? Continuing with treatment after detox is essential for the long term future, particularly as it is very challenging to maintain sobriety without ongoing support. Most rehabilitation centers have outpatient programs available to provide continuity of care after returning to daily life which can be vital in ensuring a successful recovery from addiction. Some people choose to go into a ‘half-way house’, where alcohol and drugs are not available and a structured program can be continued until such times they feel able to return to normal daily life. There are also plenty of support groups for people dealing with addiction, where a sense of camaraderie and understanding can significantly boost progress. Although the prospect of detox can be frightening to people with drug addiction issues, it is a necessary evil in the whole treatment process. By being in a controlled and supervised environment, the right detox program can be devised by medics who are aware of the specific needs of each patient. Structured detox can relieve many of the side-effects of withdrawal too, leading to a more comfortable experience that’s supported with therapy and counseling for a more holistic approach.